Here it comes, the big seven-oh. Next Wednesday to be exact; around 6:45 GMT, to be even more exact. It was quite an entrance, as I recorded in We Are Doomed. I was actually born around breakfast time on a Sunday morning, at a nursing home behind St. Matthew’s church in the small English country town of Northampton. (Annual venue for the nation’s biggest ram fair. Really.) With VE Day just four weeks in the past, the church bells were ringing, a thing that had then only recently been re-permitted. During WW2, church bells were to signal that the Germans had invaded mainland Britain, and the ringing of them was forbidden for other purposes. The town’s boy scout troop was marching up the Kettering Road from Town Centre to the church, with their band a-playing. (This is my father’s account of the event.) It was some welcome into the material universe, though my own recollection of it is naturally indistinct. 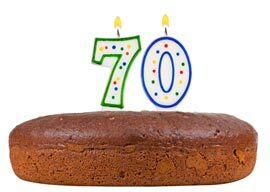 Making it to seventy is not much nowadays. “Seventy is the new fifty,” my friends assure me. As the scriptural limit, though, seventy is a good point at which to take stock, to look back and get some idea of the shape of one’s life. Doing that, my main impression”as I also said in Doomed“is of stupendously good luck. I have got through pretty much my entire life without ever having to work very hard, without ever having seen my country invaded, without enduring war or depression, without suffering any horrid illness, without ever going hungry or wanting for anything. What luck! Regrets, I”ve got a few, but no more than the average number: missed opportunities, wasted time, small acts of selfish unkindness to people who deserved better of me. Not altogether a bad tally, as these things go. The Master said: “At fifteen, I had my mind bent on learning. “At thirty, I stood firm. “At forty, I had no doubts. “At fifty, I knew the decrees of Heaven. “At sixty, my ear was an obedient organ for the reception of truth. You can get an argument going about fine points of translation there. The sixteen English syllables that follow the word “sixty,” for example, are just two syllables in the Chinese original: er shun, literally “ear obey.” The old boy was cryptic. That’s not even him at his crypticest. No doubt Legge was doing his best, as we all must. Looking back at the shape of my own life, it hasn”t actually been very Confucian. Fifteen. Mind bent on learning? Not really. What my mind was mainly bent on in the early summer of 1960 was (a) reading all the science fiction I could find, (b) scraping a “pass” in my weak subjects”Latin, History, Eng. Lit.”on the General Certificate of Education, which I sat at Ordinary Level that year, and (c) constructing a card model of five cubes in a dodecahedron, one of the more challenging assignments in Cundy & Rollett’s Mathematical Models. Nerdy kid? Yep. Thirty. I had a regular job, an apartment, a car, and a couple of credit cards, so “standing firm” isn”t bad for external circumstances. My psyche, though, was going through some acute distress”a nasty case of philocaption that it took me years to shake off. From this vantage point those psychic woes look like wasteful folly, but of course it’s different at the time. “Life can only be understood backwards; but it must be lived forwards.” That’s Kierkegaard.